Today, Microsoft officially announced that it will surrender its EdgeHTML and Chakra script engines, and move to Chromium for their first-party browser, Microsoft Edge. This is great news for the company as a once dominated browser market. There are many reasons for this change, and the move is good, but it is also a little sad on the web as a whole. Although the embedded browser on Windows 10, installed on around 700 million active devices, Edge owns only a small fraction of the desktop surfing market. Google Chrome is far from the leader here, and with Google's relentless update plan, there is no indication of this reversal anytime soon. I remember when Google Chrome was launched, wondering if the world really needed another browser, and clearly the answer was no. All that was no was not for Chrome. 0, developers would often never see if a website worked on Edge or not. Although Edge was the most compatible browser Microsoft ever sent, it was still not enough for a perfect online experience on each site. If users ran into a problem, they would only move to Chrome even if they had given Edge a chance. The move to Chrom as the basis of Edge should improve the situation pretty much. In addition, Microsoft will release versions of Edge based on Chromium for Windows 7, Windows 8 and even MacOS, as well as Windows 10. This should help developers using these platforms, test Edge if they need. 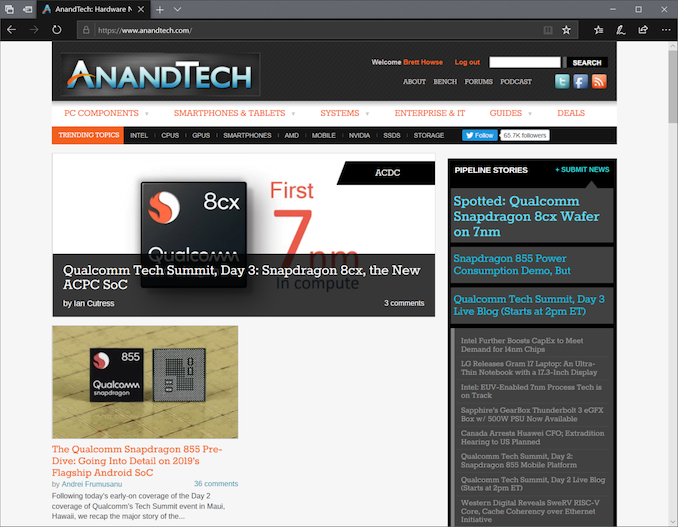 In addition, Edge has already been run by Chromium on Android, so the team is at least somewhat familiar with what it can do. Microsoft has been heavily involved in open-sourcing its own software lately, and Edge will now join the Chromium community with its own contributions. Microsoft is committed to continuing to promote web standards, bringing the current benefits from edge to chrome, such as accessibility and security features. By embracing chrome, they will have a much greater impact on the web than they could ever have kept their own code so it should be a victory for people who never even use Edge. It's sad that the web has evolved into This and although you can not really compare the world of IE6 to today, there are similarities that can not be overlooked, but for Microsoft and its users, this is a good move, and we look forward to seeing how the project is developing.